The first time I started washing the dishes, I was 7 years old. I owe my aunt for teaching me how to wash the dishes (I was living with her back then). For her, “dishwashing” means perfectly clean dishes, yet water and soap are conserved. Meticulous, yet straightforward. It was a standard I treasured so much. But as years passed, I noticed that dishwashing was becoming a boring monotonous task. I began to despise it, believing it was robbing my time I could have used for play. Eventually, I was known as the dish breaker — breaking a plate or a glass more often than the others. I know it’s an accident, but why not to my sister, cousin, or even my aunt? What’s wrong with me? This made me realized I wasn’t being present — I wasn’t paying full attention. This, could have saved me from breaking many dishes. But the point isn’t only mindfulness when washing the dishes, but in everything we do. If we’re not fully present, that means, we’re more inclined to commit mistakes. That means, we may miss the whole point of the task — the purpose, the joy, and the rewarding experience. How many times you wash the dishes while thinking about your next task? I’m guilty doing that most of the time. Be mindful in everything you do — wherever you are or whatever the condition is. I know it’s hard. But I know, too, it’s possible. 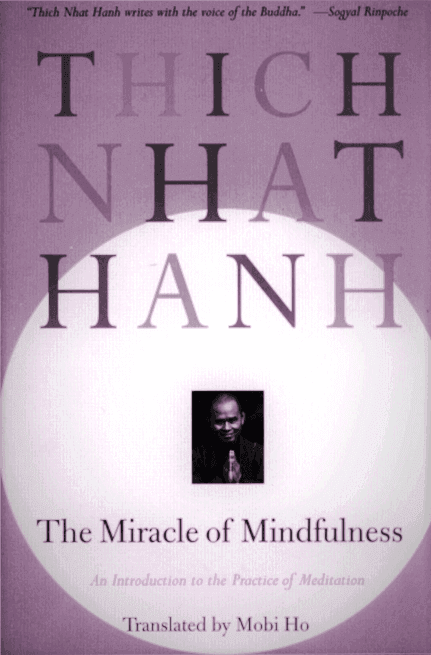 “The Miracle of Mindfulness” is a life-transformative book that teaches the power of mindfulness. It is originally written in Vietnamese by a Buddhist monk, Thich Nhat Hanh — one of the world’s most iconic Zen masters — and was translated in English by Mobi Ho.